Quality Assurance SOP Guide from C.H.I.P.S. 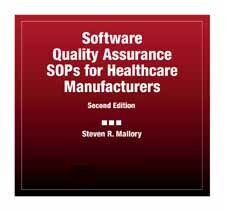 Software Quality Assurance SOPs for Healthcare Manufacturers provides not only guidance for generating documents but also templates that can be used to establish the documentation for a software quality assurance program for healthcare manufacturers. Readers can use the policies and guidelines as presented, modify them for use within their organizations, or use them to compare and contrast with any existing software engineering policies and SOPs within their organizations. They can also use the project documentation examples as presented within this volume. In this second edition, all templates have been revised and several new templates have been included.